signed by all the supper patrons. 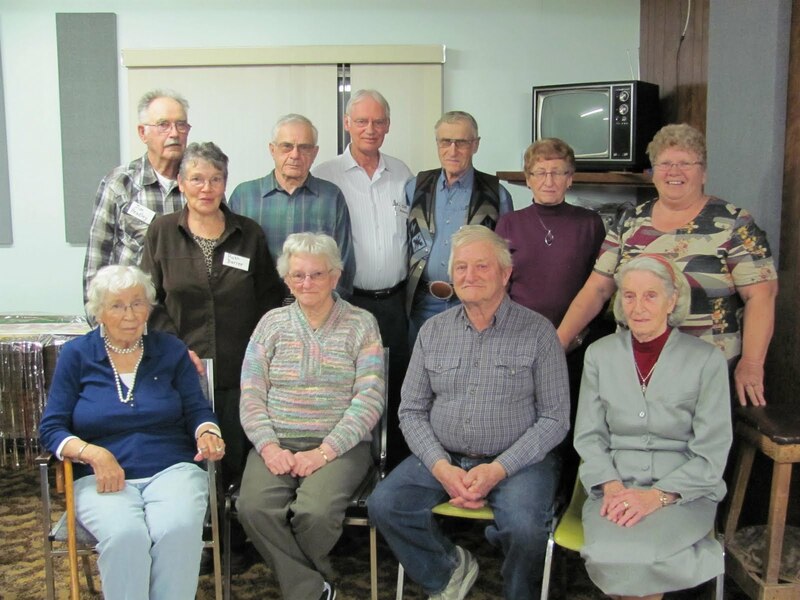 The Seniors' Drop In Center in Caroline now draws people from all over the West Country. There is a pot-luck supper every third Monday of the month at 6pm at the center. Low cost outings for seniors are also organized by the Luchkas. Jeanne and Orest taught school in Caroline, beginning in the 1960ies and Orest was a long serving principal of Caroline School before retiring in Caroline. Orest also worked as a volunteer on Caroline's ambulance service for many years and is the secretary of the Caroline Lions Club. The members of the Senior's Drop In Center wrapped up the year with a hearty meal and good cheer at the Legion on Monday, December 20. Front: Millie Knorr, Noel Delorme, Stella Cooper. Back: Vi Larsen, Charlie True, Chris Orr, David Parfelt, Barb Proudler, Joyce Pengelly. What has now become an annual event in Caroline, the Cermak family sponsored Christmas dinner at the complex on Christmas Day, was well attended this year with some 80 plates served. People from areas far beyond Caroline attended, both as patrons and volunteer helpers. Merna and Bryan with family and some of the helpers, along with Santa, posed for this photo after the meal was over. Other volunteers, not in the photo, were Nathan and Jill Moore and family and Jerry and Sherry Pratt and family. Local musicians also got together to form a band that provided music for the event. When we were on our way back from Afghanistan, we flew out of Baghram Air Field. We went through customs at BAF, full body scanners (no groping), had all of our bags searched, the whole nine yards. Our first stop was Shannon, Ireland to refuel. After that, we had to stop at Indianapolis, Indiana to drop off about 100 folks from the Indiana National Guard. That's where the stupid started. First, everyone was forced to get off the plane-even though the plane wasn't refuelling again. All 330 people got off that plane, rather than let the 100 people from the ING get off. We were filed from the plane to a holding area. No vending machines, no means of escape. Only a male/female latrine. It's probably important to mention that we were ALL carrying weapons. Everyone was carrying an M4 Carbine (rifle) and some, like me, were also carrying an M9 pistol. Oh, and our gunners had M-240B machine guns. Of course, the weapons weren't loaded. And we had been cleared of all ammo well before we even got to customs at Baghram, then AGAIN at customs. Soldiers on the way home from war, who had already been inspected, reinspected and kept in a SECURE holding area for 2 hours. Ok, whatever. So we lined up to go through security AGAIN. This is probably another good time to remind you all that all of us were carrying actual assault rifles, and some of us were also carrying pistols. TSA Guy: You're not supposed to have them. Me: Dude, just give him your damn nail clippers so we can get out of here. I'll buy you a new set(hands nail clippers to TSA guy, makes it through security). To top it off, the TSA demanded we all be swabbed for "explosive residue" detection. Everyone failed, (go figure, we just came home from a war zone), because we tested positive for "Gun Powder Residue". Who is hiring these people? This might be a good time to remind everyone that approximately 233 people re-boarded that plane with assault rifles, pistols, and machine guns - but nothing that could have been used as a weapon. A madcap shelling exercise staged by the puppet forces in the waters off Yonphyong Island in the West Sea of Korea on Dec. 20, naval maneuvers conducted by a puppet navy fleet in the East Sea of Korea in its wake and the large-scale joint firing exercises staged by the puppet ground and air forces of south Korea in the central sector of the front, etc. were the products of the dangerous collusion between the U.S. and the south Korean puppet authorities. The south Korean conservative authorities seek a way out of their ever-deepening ruling crisis in boosting cooperation with the U.S. and escalating the confrontation with fellow countrymen. They consider this as leverage for getting rid of the crisis and confusion and staying in power. They orchestrated the Yonphyong Island shelling incident to achieve this purpose. By perpetrating military provocations one after another in the West Sea of Korea the south Korean puppet forces sought to divert elsewhere the south Korean people's attention and realize their wild ambition to invade the DPRK. It was none other than the U.S. that egged those forces on to spark off the above-said shelling incident and escalate the tension on the Korean peninsula. The U.S. is keen on increasing the tension on the peninsula, opposed to any process to preserve peace on it. This is designed to save its policy towards Asia and its strategy towards the DPRK from their repeated failures and retain its supremacy over the region. Armed clashes have not occurred in the West Sea of Korea despite the dangerous collusion between the U.S. and south Korean war-like forces aimed at provoking a war of aggression against the DPRK. This is entirely thanks to the pluck, the self-restraint and steadfast will of the DPRK to preserve peace. But there is a limit to its patience, too. The puppet regime of south Korea is so despicable and coward that it cannot maintain its power even a moment without the protection of its American master. Its desperate efforts to do harm to the DPRK in reliance on this master would only precipitate its self-destruction. Editor's note: This article clearly demonstrates the venom that has divided the Korean people for some 60 years now. It is a living remnant of a hot spot in the cold war between east and west. And the allegation is that it is being used to stir up more trouble. What do you think? There is room for comments underneath the article. Was the timing of the September 11, 2001 demolition of the twin towers in New York related to the momentum of public hysteria built up about the year 2000? Will something similar be engineered during or after 2012? I wouldn't be surprised. "After digging as deep as 30 feet in Western Australia’s Pilbara region, Jack Lucknow, a self-taught archaeologist, reported that he found absolutely stuff all. Jack has therefore concluded that 250 years ago, Australia had already gone wireless." Just makes you bloody proud to be Australian. Janis Hrappstead from the Shepherd Food Bank in Caroline received a donation of $1000 from the Caroline Lions Club represented by Debbie Rahn, Orest Luchka, Al Marchant and Bob Penner. The food bank is run under the umbrella of the Nazarene Church. The Caroline Elks Club donated $2000 to the clinic for the chair occupied by clinic doctor Gorden Brown (center). (Podiatry involves foot and lower leg care). Present from the Elks to present the cheque were Arnold Kaiser and Gordon Armstrong. The donation was received by Caroline & District Chamber of Commerce and Village of Caroline representatives Bob Pryor, Laura Cudmore and Reg Dean. Eric Berg from the Shell Caroline gas plant presented a cheque for $5,000 to Caroline Chamber President Reg Dean. Back: Caroline Deputy Mayor Bob Pryor, Dr. Gordon Brown and Mayor Laura Cudmore. The chamber is the financial host of the clinic facility which also houses a chiropractic service. Alberta Health Services funds medical services offered at the clinic. Jean Kaiser (right) from the Raven Community Association presented a cheque for $500 to Janis Hrappstead from the food bank. Caroline Elks Arnold Kaiser and Gordon Armstrong donated $300 to food bank Christmas Hamper Program representative Janis Hrappstead. Depending on the number of Christmas hampers distributed, food and monetary donations can be used to bolster the food bank service over the rest of the winter as well. Elementary students put their heart into it at the school gym on Thursday, December 16. The packed audience of relatives and friends were part of a very enjoyable experience for everybody. Art students at the school created a local Christmas theme on the walls of the gym and behind the stage. The entry of Santa completed the picture at the end of the show. The perception of gold and silver having inherent value is deeply embedded in the human subconscious. The Chinese are using this fact in a very creative way. Keep an eye on this index. It is a peek into the future. Many Albertans live in a fool’s paradise, in spite of warnings from Bank of Canada Governor, Mark Carney that the debt levels carried by Canadians are very high and that there is no guarantee that interest rates will remain very low forever. Older folks remember the carnage wrought by spiking interest rates in the 1980s when a lot of people walked away from their houses and gave the keys to the bank. We have been conditioned, yes, conditioned, or more crudely put, brainwashed, into the belief of perpetual growth. People that graduate from universities with degrees in economics are the worst because they are leading the rest of us down the tunnel of ignorance to a dead end. Perhaps we shouldn’t blame them because they had blinders put on in elementary school and were led down the garden path all the way up to and including their graduation from university. The problem is that we want to believe in perpetual growth and are literally groping for information that will support this fallacy and ignoring information that does not. This explains what happened in the real estate market prior to the 2008 crash. It was thought that property values would continue to increase generating perpetual profits for those that were buying and selling real estate. The big winners were not the people that were buying and selling, but the people that financed these transactions by way of interest bearing loans. And as the prices went higher and higher the interest rates went down, creating the illusion that repayments were manageable. What was conveniently forgotten was that good paying jobs were needed to make those payments; jobs that disappeared when the bubble burst in 2008. Now the buzz in Alberta is that “the oilpatch will boom again”. There have been massive investments in oil properties by transnational corporations and sovereign wealth funds. Our oil sands are the main target of these extractive enterprises because of the current relatively high price of oil. We Albertans should know better than rely on this in planning our future. Boom and bust is the story in Alberta, going back a hundred years. We should remember that the price of energy depends on factors we have no control over, and it could plunge overnight. This has already happened with natural gas because relatively shallow shale formations gas can now be recovered at low cost due to improved extraction technology. This has depressed the price of gas to the point where it is becoming uneconomical to produce it from deeper formations. The US is now becoming increasingly independent by supplying gas from local sources, leaving Alberta gas in the lurch. Oil is more of a world commodity than gas because of its ease of transportation, but the world economy is very shaky at this time with big financial troubles brewing in Europe. So, Mark Carney, if you increase interest rates, you may have to print the money to make up the difference between old and new interest rates, because we, your humble subjects, will likely have problems in just paying our regular bills. One hundred and thirty-one demonstrators, Chris Hedges among them, were arrested in front of the White House last Thursday. The solemnity of that funerary march, the hush, was the hardest and most moving part of Thursday’s protest against the wars in Afghanistan and Iraq. It unwound the bitter memories and images of war I keep wrapped in the thick cotton wool of forgetfulness. Civilization? Perhaps it was not born just 6000 years ago somewhere in the Middle East. Civilization may be almost as old as the Universe itself because it is a unique organization of "cells' (human beings) that brings into being a powerful organism capable of transplanting itself across the Universe. In this video, Carl Sagan asks some questions. Landgrabbing with bulldozers. Is that so different from using army tanks? (Rimbey, AB) A district judge in Montana ruled on Monday that the private Canadian developer, Montana Alberta Tie Line (MATL), has no legal authority to take someone else’s private property to construct a private-for-profit high-voltage transmission line from Lethbridge to Great Falls Mt. Montana Alberta Tie Line (MATL) is not a regulated public utility. They are a private-for-profit company. The Lavesta Area Group welcomes the court’s decision and views this as a victory for landowner rights. The Lavesta Area Group has decided, as a result of this court victory, to increase its financial contribution to $50,000 in support the landowners fighting against Montana Alberta Tie Line Inc (MATL) south and east of Lethbridge. Montana Alberta Tie Line (MATL), is a private-for-profit company that wants to build privately held transmission lines on other people’s land. We believe this is a private matter between a landowner and a developer and should remain so. However, when a developer tells a landowner that there are no choices – the landowner must accept an offer that cannot be refused. We are reminded when this behaviour was called extortion and racketeering and was not tolerated. We believe property rights and democratic rights are worth fighting for! Instead of providing the kind of detailed studies Albertans should expect before spending some $600 million on the Heartland Transmission Project, the Alberta Electric System Operator (AESO) resorts to its worn-out hand-waving arguments about mom, apple pie and the need for lots and lots of wires. AESO says it must build a robust transmission system in advance of need, so a really important question is how much in advance? The customers the Heartland line is supposed to serve have said the line won’t be needed for 20 years, if ever. It’s ironic that AESO says its plan gives industry the confidence to do business in the province when that very industry is saying excessive infrastructure like the Heartland project will result in unnecessary costs, job losses and industry leaving Alberta. If the AESO won’t listen to those who are supposedly responsible for much of the projected load growth, how can we possibly have any confidence in their forecasts? With regard to AESO’s mandate to ensure that generators can get their product to market, how many other businesses in Alberta have their delivery costs paid directly by Albertans, regardless of how far away they locate from their customers? Answer — none, because it defies common sense, not to mention the premise of a free market economy. To justify the Heartland Project, AESO once again trots out its Gregorian chant that demand rises annually by ‘two cities the size of Red Deer.’ That is partially true, except AESO neglects to mention that most of Alberta’s load growth in the last decade was met by on-site generation. What’s more, with transmission costs set to skyrocket, self-served load will grow even more, further eroding any need for the Heartland Project. Even if the load in Alberta is going up, it is generation, not transmission that is needed. The recent announcement of a gas-fired plant near Sundance confirms that even TransAlta thinks gas generation will be a big part of Alberta’s future. The recent approval of an ENMAX gas-fired plant near Calgary confirms that generators can be built close to load. We need a reliable supply of electricity, not oppressively expensive transmission. Another AESO chant is that Alberta has not seen a major transmission investment in the last 20 years. Yet, AltaLink’s balance sheets show an increase of $464 million in assets from 2008 to 2009 and of $856 million, or more than 100 per cent, from 2005 to 2009. So much for AESO’s “no major investments” claim, unless $856 million is considered chump change when you’re spending someone else’s money. No wonder I hear AltaLink’s vice-president Leigh Clarke every time I turn on the radio. After all, in addition to the $600 billion Heartland Project and that other $856 million, AltaLink was handed a $1 billion-plus project on a platinum platter by former energy minister Mel Knight. Apparently the need to tender public contracts ends somewhere just below a billion dollars. Or does that only work if a company vice-president (i.e. Clarke) is also on the executive committee of the Alberta PCs? The AESO letter also talks about in-depth analysis. That’s rather odd because, of the in-depth studies I am aware of, none were done by AESO and all trash Alberta’s transmission policy. The University of Calgary study showed that the need for transmission has been exaggerated, and the lines that are planned will cost billions more than the obvious solution of local generation. So you see, AESO seems to have nothing but hand-waving. And to spend $600 million on the Heartland Project, based on hand-waving rhetoric, is definitely NOT in the public good. An elected political "leader" is essentially a stage actor. After a few drinks, without his script, his real personality shines through. 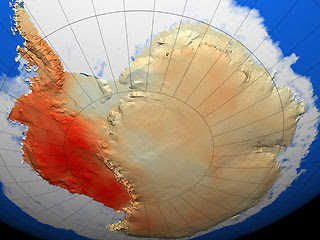 Dec. 13, 2010: On August 1, 2010, an entire hemisphere of the sun erupted. Filaments of magnetism snapped and exploded, shock waves raced across the stellar surface, billion-ton clouds of hot gas billowed into space. Astronomers knew they had witnessed something big. It was so big, it may have shattered old ideas about solar activity. People seem to get quite excited about pyramids. Some believe that they focus to a point below their tops where great energy is believed to be present, while others hold that all the talk about pyramids is pure nonsense. For whatever reason, emotionally charged ideas about this subject abounds. And, to add to the mystery, there are a lot of pyramids in existence, most notably in Egypt where a lot of digging has taken place over the years, and mummies of Pharaohs unearthed. Other very large pyramidical structures are also present in the Americas. Other kinds of massive earthen structures were also created, notably the Hanging Gardens of Babylon, some four thousand years ago. In 1961, as a teenager, I walked in the streets of that ancient city shortly after excavations began in earnest, and the base of the hanging gardens was still there after blowing sand had worn the rest down to ground level over the years. Actually, what had happened was that the streets of Babylon had filled up with sand and grit driven by windstorms over the years, so that the bottom 8 feet or so of the city had been perfectly preserved. Emotions aside, why would the people of yesteryear put so much time and energy into building huge earthen structures, when the struggle for survival itself would seem to be enough of a challenge? What might be the practical reasons for going to all this work? We know that mighty castles were constructed in order to give defenders an advantage over would-be attackers, the very sight of them was a deterrent. But pyramids? Yes, indeed, their main purpose was essentially the same as that of a castle, but by way of a slightly different route: The task of constructing such a colossus required the presence of a highly organized work force. One can imagine that, working together in groups, relationships were formed between individuals and teams of various sizes, and with a variety of specializations. A hierarchy of authority was established and activities coordinated to achieve the goal of constructing the pyramid, likely with the use of earthen “scaffolding” that was just as bulky as the final structure. A massive task indeed, but not impossible. We now arrive at the practical goal of this whole exercise. In Egypt the Nile river, a very substantial water course regularly flooded huge alluvial plains, leaving behind a fertile sludge of debris collected by the flood water during its journey from the highlands of Africa to the Mediterranean Sea. In order to secure a bumper grain crop, a lot of people had to work very fast to plant and harvest the crop, ensuring prosperity for all. But imagine, all the hungry eyes watching from the hills. However, what deterred them from coming down to collect the riches of the plains was the Pharaoh's army of pyramid builders that had just harvested the crop. That’s because they could change from shovels to spears and swords in an instant. And who would argue with that organized machine? So, perhaps in an era of increasing unemployment and organized crime, we should pick up on the wisdom of the Pharaohs and provide rewarding tasks for all, even if pyramids are not the end result? As part of their ongoing fund raising activities The Caroline Elks hosted their annual Wild Game Supper at the Caroline Complex on Saturday, December 4. It was an all-volunteer effort with meats served from wild game including deer, wild boar, caribou and moose. The function was very well attended by local people. However, more volunteers are needed in order for this event to be continued in upcoming years. These busy elves, and others, gave the school a Christmas look on Wednesday December 1, heralding in the Christmas season. The school mascot, Clash the cougar, was decorated as well. The school Christmas concert this year will be held on Thursday, December 16 at 7pm and will be repeated on Friday, December 18 at 10am. Be ready for an “Old fashioned Christmas” at the upcoming Christmas celebration at the Church of the Nazarene on December 18 at 6:30pm. The show is put on by Caroline Musical Productions and features the Caroline Family Singers and the Home Town Kids. Donna Stahlwick is Choir Director and choreography is by Lillian Coulson. Daytime fire and accident coverage from the Caroline fire hall can no longer be guaranteed due to a lack of available volunteers as of December 1. This fact was emphasized at a recent meeting of the Village Council, following the announced move to a new job outside of the community by one of the department’s veteran fire fighters. The Caroline Fire Department serves a population of some 5000 people in Caroline and the surrounding countryside and responds to highway and other accidents as well. It uses equipment that would be the envy of many professional departments for a variety of tasks, including vehicle extrication work and back country rescues. This is an ideal opportunity for action oriented individuals to participate in real drama, rather than just watching it on TV. A volunteer commitment can also lead into a highly rewarding career as a professional fire fighter. For more information, contact Patrick Oslund at 403 845-4444. Families, seniors and singles who are struggling financially during the holidays are welcome to receive Christmas hampers from the Shepherd’s Food Bank in Caroline. Food and monetary donations are gratefully accepted with cheques payable to Christmas Hamper and Shepherd’s Food Bank, Nazarene Church, Box 195, Caroline, Alberta, T0M 0M0. Donations are now accepted to ensure that these programs are available again this Christmas for families and children in need. Donors, nominators and applicants can call Caroline Neighbourhood Place at 403 722-3787 for more information. Dec. 6, 2010: The Geminid meteor shower, which peaks this year on Dec. 13th and 14th, is the most intense meteor shower of the year. It lasts for days, is rich in fireballs, and can be seen from almost any point on Earth. It's also NASA astronomer Bill Cooke's favorite meteor shower—but not for any of the reasons listed above. "The Geminids are my favorite," he explains, "because they defy explanation." “Cyber warfare” is a term coined fairly recently and involves the competition for control of information used by groups who have conflicting interests, be they nation/states or supranational entities. within these buildings prior to the air attacks and detonated amongst all the confusion that took place on that fateful day. So, where does that leave us? Basically that it was a pre-planned attack on many fronts by individuals/groups unknown and that the fanatical aircraft pilots were stooges used to create a bogeyman and deflect attention away from the real perpetrators. of a police state where citizens are rapidly becoming hostages of their own government. (whatever that means) to account for his release, on the Internet, of so called “state secrets” that “could endanger the lives of citizens world wide”. Are we now witnessing another “shock” to the system that will seek to manipulate public opinion to a point where our legislatures and parliaments across the world will enact legislation to censor information traffic on the internet and arrest would be “terrorists”? (that turn out to be embarrassing messages from some diplomats, mostly)? How did all this information end up in the lap of Wikileaks? Why hasn’t the website been closed down a long time ago if it poses such a danger to Civilization? Something stinks. Are Osama and Julian going to join hands in retirement? Caroline School students once again rose to the challenge of brightening the day for less fortunate children in other countries by filling shoe boxes with personal kinds of items. This annual event has now been supported for many years by members of the Caroline community and this year's harvest was 59 shoe boxes. Organizers this year were Mrs. Denham and Ms. Kanda, along with helpers seen in the photo. The parcels are destined to the distribution center in Calgary where they will be sorted on December 3. Last year, Canadians donated 640,569 shoe boxes to the program, run by the Samaritan's Purse organization. For many years now the children in Caroline have taken time out to put together gift parcels, packaged in shoe boxes, for those children who may have few bright spots to look forward to in other countries. “It's a special year, too, for Samaritan's Purse: the organization's new Virtual Shoebox program is now ready to take full flight. Visitors to the organization's website ( www.samaritanspurse.ca)can create their own custom-designed shoeboxes without ever leaving their home. It's a brilliant idea, but one that Jeff Adams, director of communications for Calgary-based Samaritan's Purse Canada, says was initially brought in last year on a trial basis to make it easier for people living in remote, northern communities to donate shoeboxes. "It became obvious that this could be used for a lot of people, like students at university who don't have time to shop for a shoebox, or those with kids or busy jobs," says Adams. The web tool lets visitors choose items pre-purchased by the organization, right down to pencils and toys, then pay by credit card once the box is filled. The boxes for this inaugural year of the Virtual Shoebox program, he notes, will be going to a very deserving place: Haiti. Samaritan's Purse International, which has offices in nine countries, will send 250,000 online-created shoeboxes to the troubled Caribbean country this Christmas, with the Canadian office accounting for 20 per cent. Filling the need for children during the holiday season is something Samaritan's Purse has been doing since 1992, when the 40-year-old Christian relief organization that provides so many needed services for the poor around the world decided to add this holiday offering. Caroline Musical Productions will present their annual annual Christmas program on Saturday, December 18 at 6:30 pm at the Church of the Nazarene in Caroline. This year’s theme is “An old fashioned Christmas”. The program will headline the Caroline Family Singers. Updates to follow. 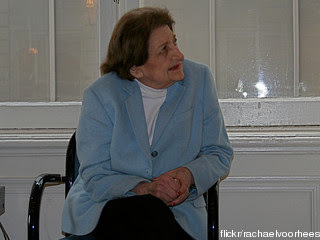 Helen Thomas, the long-time White House correspondent who was forced to apologize and retire last spring after making comments about Israel and Jews, stood by those remarks yesterday at an event in Dearborn, Michigan -- and then made even more fiery statements. "Congress, the White House and Hollywood, Wall Street are owned by the Zionists," Thomas said during her remarks at an Arab-American workshop, according to The Detroit News. "No question." Before she spoke, Thomas told reporters that her comments in June, when she said Jews in Israel should "go home," were "the truth." "I stand by it. I told the truth," Thomas said. "I paid a price but it's worth it to speak the truth." Asked by The Detroit Free Press how she'd respond to people who say she's anti-Semitic, Thomas responded: "I'd say I'm a Semite. What are you talking about?" Thomas was in Dearborn to give the keynote speech at a workshop titled "Images and Perceptions of Arab Americans: The New America: Mom, Apple Pie, and Arab Bashing." The event's program brochure called her retirement a "political execution." The Detroit News reports she received a standing ovation. So, you think that your new credit card is secure? Morale: There is no such thing as "security". Get used to living with danger. The one that gets you always comes out of left field, when least expected.